Well, after an absence of five months from the Forum, it saddens me that my first Post since August 2018 has the subject of disposing of my collection of roughly 900+ Dinky Toys and Dinky Supertoys, plus a small collection of Corgi Toys, Hornby-Dublo and Wrenn railway boxed items. The image below was taken on 6 July 2007. Since then 750 models have arrived in my care, as well as a number have been sold. I have reached the stage whereby I have come to realise that we all are not immortal, especially yours truly. Next month I have several procedures lined up - a "minor" heart operation followed by a hernia one, the latter caused no doubt by carrying heavy boxes of Dinky Toys! I have mulled over this dilemma for many months now, and acting on the wishes of The Better One, I am having to take action to sell everything, "so that our daughters do not have to worry about it". I am currently investigating the cost to ship the collection to the UK, and initial advice is that "it ain't cheap", with an alternative being to auction the collection through an Australian auction house. I have already "lined up" two auction houses who have expressed an interest in handling the sale, should I proceed with sending the collection to the UK. These companies are located in the south of England. I will also be disposing my considerable collection of ephemera, from price lists, catalogues, advertising/press releases, signs, Meccano Advice Notes, Order Forms, factory photographs, etc, etc. If the reader of this Post is a member of the DTCA, I am prepared to listen to any reasonable offers for individual or multiple items, before the collection gets swallowed up in a commercial selling facility. So, if you are interested, make it known, if need be by writing to me direct through the association, the models that are of interest, and I will advise by return whether my collection includes your needs. (Not sure how this works with privacy being supreme these days.) There is also the possibility of somehow the Association getting involved with it handling the sale with a small percentage of the final outcome being retained by the DTCA to further the interest and preservation of Dinky Toys. So, we should all start talking!! This is obviously unchartered territory for me, so things are rather "fluid" as to how the final outcome will be. Finally, all my childhood Dinky Toys are not included as I would like to see these pass down to my grandson (or grand-daughter if she is interested!) as I would prefer to see these remain within the family, as a link with me and my parents and the future of my family..
Re : IT HAD TO HAPPEN SOONER OR LATER! UNDER INSTRUCTIONS FROM ABOVE MY COLLECTION HAS TO GO! Bruce. These are difficult messages for a passionate collector as you are, to sell your collection and we all know that it is very difficult to come to such a decision. We can all face such a dilemma. In this case it is your health that brings you to this decision. You have always done your best to bring the right Meccano Dinky Toys history and everything that has to do with it to light in the forum. Your valuable contributions are always very instructive with a lot of knowledge of, especially the automotive industry in connection with Dinky Toys models. Good that you keep the youth Dinky Toys. Among that there will certainly be the 192 De Soto Fireflite, with which you personally visited the Binns Road. I wish you a lot of strength in this difficult time and hope you get through well. I completely echo Jan’s comments, and this is a sad day indeed, but one which almost all of us must some day deal with. You have truly been one of the Dinky masters that I have looked up over the years. Your knowledge of not only the Dinky models, but also the real vehicles, plus your expertise in boxes, catalogs, and price lists......we have gained so much insight that was heretofore unknown. I hope all goes well healthwise this year for you, and wish you all the best my friend! Here is a photo of Bruce and I, along with his well-traveled Dinky Toys DeSoto, when he and his wife stopped over in LA on their way home. We spent a nice evening over dinner, reminiscing the whole time. 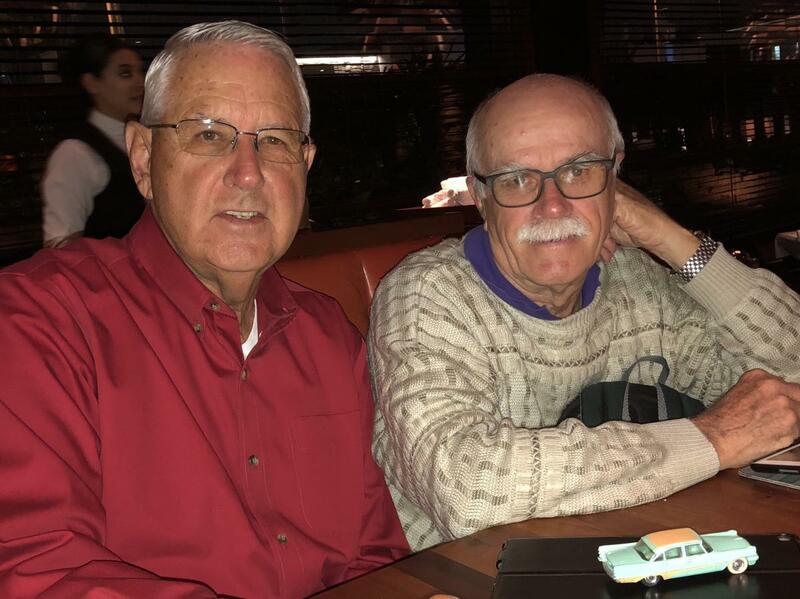 What can one say when two very loyal friends write such nice posts - I am embarrassed but very glad that I have been able to make a contribution to the one thing that has been so much a part of my life for 74 years - my Dinky Toys. Thank you both for your very kind and much appreciated words. With Jan's initial mention of my much-travelled De Soto and Terry have made its acquaintance, here are a few more images of the De Soto! Here it is, peeping out of my camera bag in Green Park, London on 29 April 2011. We had come to London to be a part of the huge throng celebrating the wedding of Prince William to The Honorable Catherine Middleton. Green Park had a large television screen where we "peasants" were able to watch the proceedings. In March 2017, Lina and I flew to the Philippines to celebrate the wedding of a niece to an Australian. They had decided to have their wedding on Borocay Island, as a means of helping the local people. Although not included in our invitation, I sneaked 192 on board, and here she is beside the pool of our hotel on 30 March 2017. Having failed to see the Northern Lights in 2016 meant a return visit was necessary, so the following year found us back in Finland, this time travelling further north than our previous visit. So, we ended up min Ivalo, well above the Arctic Circle. And, out came Number 192 to have another portrait taken on the bridge over the frozen-over Ivalo River, on 19 December 2017: Quite a difference in weather to the previous image! We have travelled extensively over the past 15 years, Moscow, St Petersburg, Warsaw, Berlin, Copenhagen, Stockholm, London, The Orkneys, Munick, Vieanna, Budapest, Istanbul, Tel Aviv, Jerusalem, Petra, Athens, and many, many places, but in most instances we were too busy to think about photographing the little 192 at every place. And of course it was rather fitting that the last image taken overseas was with my dear friend Terry and his wife and to match the image Terry included, here is my effort! Hopefully, one of these days I will be fit enough to make a return visit to Europe and this time meet you Jan O. A fitting conclusion of this snapshot of the travels of a Dinky Toys 192 De Soto. Thank you too Jan. Incidentally I had my De Soto with us when we passed through Amsterdam in 2005 on a Trafalgar Tour, in the course of our tour, we caught up on a dear friend Jos van B whom we have unfortunately lost contact. PS: I could help you with the present contact data of Jos B, if you might wish so. Being a relative newcomer I have valued, in the matter of my education about the world of Dinky, your input into the widely varied forum threads and I can only echo Jan W's hopes for your continued health and (if you can bear it) your continued contribution to our hobby. Thank you very much for your kind and most appreciated words. My documentary ephemera will be the last to go, to enable me to continue putting "stuff" on the website. I already have about 10 submissions in my draft folder so that will keep me going for a short while, with about 30 in the "pipeline" so to speak. I have always enjoyed putting details into the Forum, and sharing these with all who collect or have an interest in Dinky Toys as there is little point keeping this to ones self! 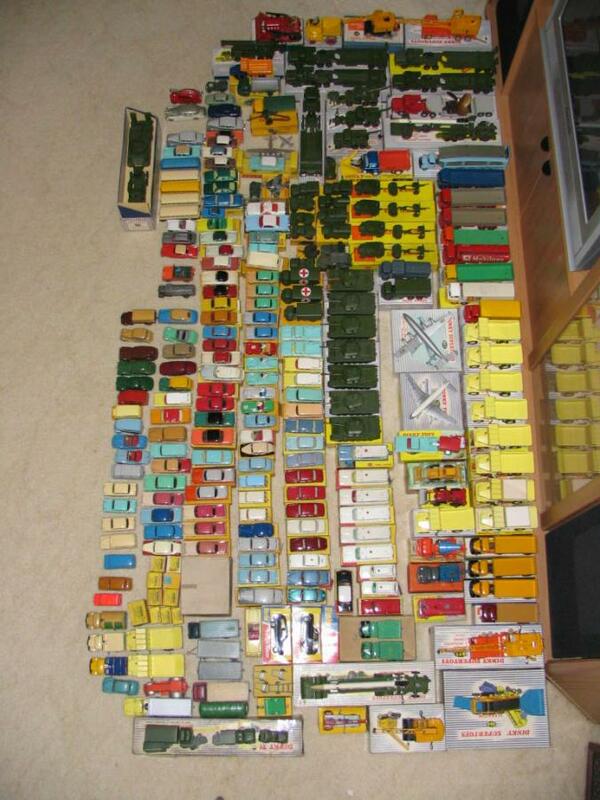 Kind regards and I hope you continue collecting and enjoying your collection of Dinky Toys for many years to come! Hi Bruce, I am sad to hear of your plight and am concerned that I may need to go through a similar cleansing experience within a few years. Already had the heart surgery and have not got enough hours in the day to control my interests in model cars, Dinky commercials and Kato N scale trains. I was a member of the Sydney Model Auto Club for a number of years and attended their Friday night swapmeets at Granvillle on several occasions, even having a sales table at two events, with the first selling most of my stock before the doors opened! Ah those were the days! I will contact you direct so that we can start some serious discussions! By the way, Tony Hanna, a longtime member of the SMAC now lives on the Gold Coast, and is now a member of the Brisbane Model Diecast Club. Here is the latest on my collection. Apparently, if I were to ship it to the United Kingdom for sale through at least one Auction House, there will be an import duty of 5% based on the insured value of the carton/case. (British-made goods being charged an import duty? Now that is a laugh!!) That means I would have to add this cost onto the auction costs, and it may not be economic for me to do so. I am now thinking of a well-known auction house through www.thesaleroom.com called Trains, Planes and Automobiles which is located in the Blue Mountains west of Sydney, NSW.. But before I go down that road, if any member may wish to contact me direct, with their needs, or simply would like to have a list of my models, this I can provide. In addition, a list is not good unless there is a picture of the item being sought. I can supply both sides, front and back, top and base to enable anyone to make a decision. I will also include a price that is of course, negotiable. By dealing direct with the owner, there is no auction or other seller fees, except postage. As for postage, Lina and I will be travelling to the UK at some point in time after my operations, and any purchases from the UK or Europe can be mailed in the UK, this saving the buyer the cost of postage from Australia. I think this would be a win-win for both parties, especially me in that I will know that some of my collection will be going to an appreciative buyer who will take good care of it, and not use it (at least for a little while) as a resaleable item!! As I have a different email address for the sale of my collection, members can write to me through the DTCA messenger service and that new email address can be provided. Kind regards to you all and I hope that you are having a safe and enjoyable Easter with your family and friends. I just sent you an e-mail a few days ago, but not sure if you got it....I only have your old e-mail address, and fear it is not current. Please send me an e-mail and then I will know....thanks!